- a cornucopia of thoughts struggling to form into cohesive sentences. To experience other skies all over the world, just click on the badge and they will take you! Ooh, great capture of this rainbow. They can disappear so quickly! capturing a rainbow is a gift. thanks for sharing. What a lucky shot of the rainbow! Nice one. Thanks for the visit, Pink! love rainbows! and you capture this one well:) happy skywatching! I love rainbows! Nice shot. Your quote is so right - a wonderful photo. Enjoy your weekend. a very nice rainbow shot. happy weekend. This is a beautiful Shot !! Really fantastic !! Such a lovely hopeful shot! And a good quotation too. Oh lovely to capture the rainbow. Till now I dont have the opportunity to snap a rainbow photo. So did you find a pot of gold at the end of the rainbow? Oh, I love rainbows. There's another rainbow picture at www.KaHolly.blogspot.com! Excellent capture. So far, I have not been fortunate enough to have my camera and a rainbow in the same location at the same time. Well done. Nice... odd to see a rainbow in a dreary sky. Good capture! A perfect one... We're so lucky, right? Beautiful rainbow! Thanks for visiting my site. 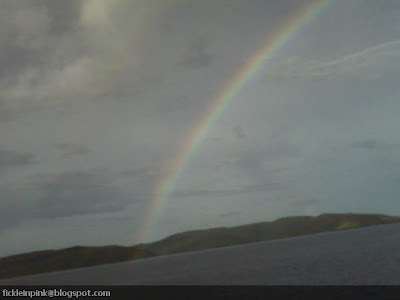 You've captured this rainbow brilliantly! Thanks so much for sharing your fabulous work with us. So glad you're playing along. my thoughts , actions, reactions on my everyday life, trying to share my part of the world through random pictures, poems, quotes, and everything in between, a creative outlet, an pseudo-anonymous space that I can call mine.